A lot of emphasis is being placed on family fitness these days, and getting together for a walk or hike is a popular way to get everybody out and moving. Get on board with your family! 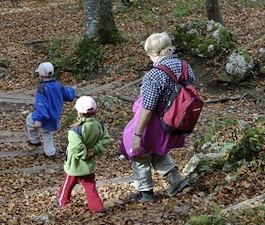 Here are some tips for family hikes and walks. Make sure everyone’s footwear fits and is comfortable before wearing them on the hike. Nothing spoils a walk or hike for children and grown-ups like painful feet! If you have new shoes, break them in first by taking short walks and wearing the shoes around the house. Keep munchies on hand for little ones while you walk. Exercise helps regulate blood sugar, so you’re already on the right track; but keeping energy levels up is important as you burn all those calories. Kids need to have access to healthy snacks (nuts, dried fruits, whole grain crackers, etc.) throughout the duration of the walk. Families include people of many ages, from young to old. Toddlers usually can’t keep up on a long hike through the woods at top walking speed. Older adults need to stop and rest periodically, especially if it’s hot. To include all family members, arrange the walk or hike so that frequent stops are allowed for old and young, and make sure those stops include a place to snack, drink, and play for ages in-between. Check your local community events to see what walks, tours, and hikes are being held. Combining exercise with personal hobbies and interests helps motivate family members to participate. A good place to start inquiring would be your local park and recreation service; they may know where there are wildflower identification walks and other informative hikes in your area. Also check with your local historic society for tours and hikes to explore historic places. You can also arrange your own interest-themed hike. Take a field guide and identify things that family members find interesting, such as bird calls or medicinal plants. Invite friends and other families to go with you on your walk. If there is a park or playground along the way, all the better – kids and adults can get some social time in as well as outdoor exercise. Making hikes and walks into neighborhood events can also be motivational and fun. Chances are, there are people in your community who need help walking their dogs. Illness, age, vacations, and other life circumstances often leave people unable to walk their dogs like they used to or want to. Volunteer to take these animals out for a walk. Everyone gets exercise and dog-loving kids may find this very motivational! Is my child’s behavior a side effect of medication?